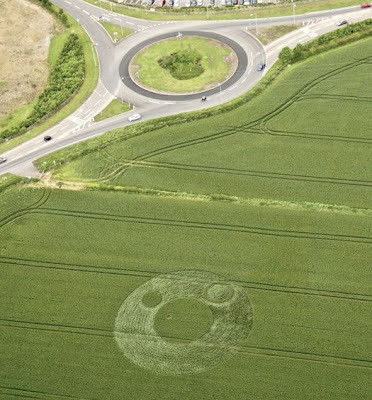 There is a crop circle in a field next to the A361 between Frome and Berkley in Somerset. It was not there yesterday, so has happened last night. Several people and the farmer there already when I saw it while walking my dogs at 8am. Farmer said there will be little he can do to stop people from going into his field, so is hesitant but ok about visitors as long as they stay to the tractor lines and do not leave litter or damage any crop. The one with a ring is all spiral swirly inside. The whole formation is at a rough guess 25-30m. No sign of disruption to the standing circles. The field is planted with wheat. The larger circle has a diameter of approximately 30meters. Does the symbol represent something to do with planetary orbit or the solar system? This is a picture of a on/off switch! The center circle is a dial, with a mark on it. the outer ring has two circles, one shaded in the other not shaded in. these mark the on and off positions. In the picture the switch is in the "ON" position. Come on guys! its not rocket science, some one is yanking your chain! i visited this crop circle today to examine it... however i was thoroughly disappointed as it is undeniably fake. 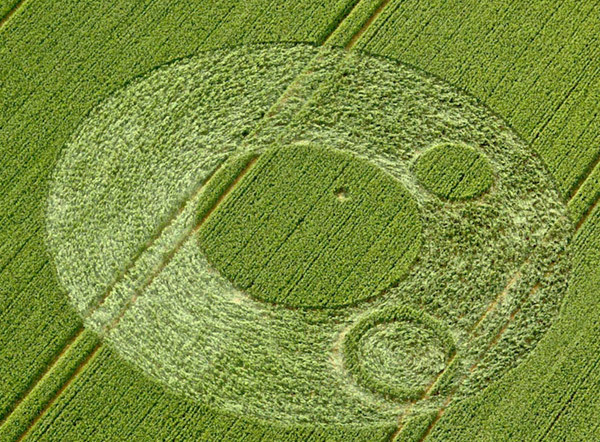 have never seen a Crop Circle,but are very interested but to say: "undeniably Fake!" Means HOW? ?